Born in 1945 in Buffalo, New York to Thomas R. and Joanne Joyce, Michael Thomas Joyce is the eldest son in a family of eight children. As a youth, he was heavily influenced by the Catholic faith from his family and his education. He attended Catholic and Jesuit institutions, Canisius High School, Canisius College, and St. Francis College, until he enrolled at the University of Iowa in the early 1970s. He earned his MFA from the Iowa Writers Workshop in 1972 and served as a Teaching Writing Fellow there from 1973–1974. In addition to his education in writing, he has extensive experience combining technology and the written word. 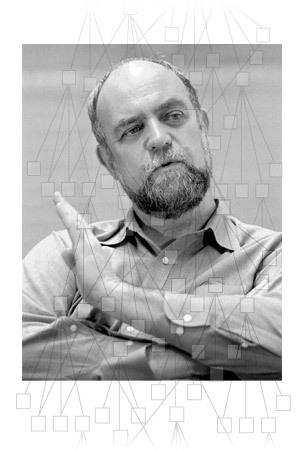 During 1984–1985 he was a Visiting Fellow at the Yale University Artificial Intelligence Project and worked in interactive video research as member of a multi-disciplinary team directed by Mary C. Milton, then of the Markle Foundation. Initial work on Storyspace, hypertext software for writers and readers that M. Joyce developed with Jay Bolter and John B. Smith, was also funded by the Markle Foundation. M. Joyce served as coordinator for the Center for Narrative and Technology and associate professor at Jackson Community College, Jackson, Michigan from 1975–1995. Since 1995 he has taught at Vassar College as an English and Media Studies professor and serves as Director of the Center for Electronic Learning and Teaching there. Joyce is a prize-winning author as well as a teacher of writing. His hypertext fiction, Afternoon, a Story , has been called “the granddaddy of hypertext fictions … a legend” by Robert Coover writing in The New York Times , and “an information age Odyssey” by Pamela McCorduck writing in The Whole Earth Review . Another hypertext fiction, Woe , was the centerpiece of a special hypertext issue of the journal Writing on the Edge . He has been on the program of every hypertext meeting sponsored by the Association for Computing Machinery (ACM) since their inception in 1987. He has lectured and published widely on issues relating to hypertext and writing. His essays on hypertext theory and pedagogy are primary texts in those fields. Both his linear and hypertext works have received acclaim. His linear print novel, The War Outside Ireland (1982), was widely reviewed and selected as a Small Press Book Club selection; won the Great Lakes New Writers Award in fiction; and was featured in the USIA international traveling exhibit, “America’s Best.” His hyperfiction On the Birthday of the Stranger was featured as the inaugural work for the Evergreen Experimental Site of the online version of the Evergreen Review . Two longer hyperfictions, Twilight, A Symphony , on CD-ROM, and Twelve Blue , on the world wide web, were both published in 1996 by Eastgate. His most recent collection of essays, Othermindedness: the Emergence of Network Culture (2000) was published by the University of Michigan Press which previously published his collection Of Two Minds: Hypertext Pedagogy and Poetics (1995). In 2002, he returned to his story-telling roots and published the print novel Liam’s Going . Michael Joyce draws some elements from his personal history to his work. His marriage to Martha Petry Joyce, a published hypertext author herself, and their two sons, Eamon and Jeremiah, are sometimes referenced in his essays and novels. His next marriage with author and artist Carolyn Guyer resulted in another creative relationship resulting in multiple projects co-authored by the couple. Simply put, Joyce is one of the most imaginative artists of his time. Was is a wonder work, half-poem half-narrative, an often comic nomadic history whose main character is the fleetingness of information itself. A post-cyber Pilgrim’s Progress , it limns a postmodern “ages of man” (and woman) with a phosphorescent succession of threshold events, each flaring toward an elegiac still point, although not perhaps an end. Its title figure, the word was , marks that instant of utterance outside the present, which is neither past nor future but rather the interstitial space of any telling. Like Ariel in flight, Was takes place “before you can say ‘come’ and ‘go,’” slipping away before you can “breathe twice and cry ‘so, so.’” The nomadic lovers here, as any lovers, attempt to linger in the afterglow of what was but it slips away like mist. Story begets story as if without author, events gathering into each other, as much memory as dream, their locales literally moving across the face of the globe by instants. Continent to continent, from hemisphere to hemisphere, synaptic episodes strobe across its surface like thunderstorms seen from a satellite. Yet in these brief flashes a memorable and deeply moving procession of characters passes before us in vignette, lovers and children, parents and refugees, sailors, missionaries, clowns, mourners, forlorn warriors, sweet singers.